Shasta Daisy, Leucanthemum x maximum. The Shasta daisy is the creation of plant breeder Luther Burbank. Introduced in 1901 after 17 years in development, he named his prize chrysanthemum the Shasta Daisy after the dazzling, snow white presence of Mount Shasta raising 14,000 feet above the floor of California's Central Valley. Since the birth of the Shasta daisy, many varieties have been developed. Chrysanthemum x superbum 'Crazy Daisy' is a new variety of the much-loved Shasta Daisy. 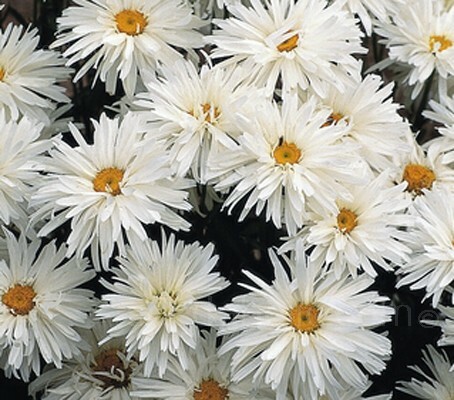 It is one of the first medium tall varieties with the classic 5 to 8cm (2 to 3in) white flower with a yellow eye, however many of the flowers have quill like petals giving Crazy Daisy a fluffy appearance. With multiple flowers per stem, the cheery flowers begin to appear in late spring and continue on for several months if deadheaded, until the cooler weather of autumn begins. Growing to a height of 60 to 70cm (24 to 28in). Crazy Daisy are unsurpassed in the border and for cutting. The clean look of the neutral white colour has made this one of the world's favourite for combining with many other flowers. Its long season of bloom and vigorous growth only enhance its usefulness in the perennial border. Shasta’s mix so effortlessly with other perennials that no garden should be without them. The flowers are highly attractive to bees and butterflies and the strong stems are great for the border, for vases or for bouquets. Sow indoors in pots or trays containing a peaty compost mix at 13 to 16°C (55 to 60°F). “Just cover” the seed with vermiculite or sieved compost. As the seed needs light to germinate. The compost should be kept moist but not wet at all times. Germination should occur between 21 to 28 days. Thin (prick out) to 7.5cm (3in) pots when seedlings have developed 2 proper leaves and are large enough to handle. Gradually acclimatise to outdoor conditions for 10 to 15 days before planting out. Choose a sunny, well-drained spot for the best performance. Shasta daisies will tolerate some shade but they may be leggier and have a sparser or shorter bloom. Space 60cm (24in) apart. The growing tips and first set of leaves can be pinched back in mid- to late May to lower the plant's height and to help create a bushier daisy. Pinching the plants back may delay their flowering by a few weeks but overall they will be sturdier and require less staking. Shasta daisies will bloom most vigorously in June and July. Extending the plants bloom time involves deadheading (removing the spent blossoms) the plant. Doing so will encourage the plant to put its energy towards creating more buds and increasing the chances of having blooms through the autumn. Shastas make long-lasting cut flowers so cutting some to bring in the house is a great way to keep deadheading to a minimum later. After the first frost, plants can be cut to the ground or allowed to remain in the garden. By spring, however, the plant should be cut down to its new basal growth. Division is necessary because the younger, juvenile plants that form on the outside of the clumps are the best bloomers. To prevent overcrowding and to make sure the plants remain vigorous, divide Shasta daisies after three or four years of flowering. Divide them as soon as growth begins in spring. Larger divisions can be planted out direct into their permanent positions, pot up smaller divisions and grow them on in light shade in a greenhouse or cold frame until they are growing away well. Plant them out in the summer or the following spring. Cottage/Informal Garden, Flower Arranging, Flowers Borders and Beds, Wildflower Gardens or Wildlife Gardens. Coreopsis, Dianthus, Balloon Flower, Catmint, Daylily, Siberian Iris, Lupine, Garden Phlox, Sedum, Delphinium and Grasses. Use them with silver or grey foliage such as artemisia and gypsophila for a more sophisticated association. The Shasta daisy is a creation of plant breeder Luther Burbank (1849 - 1926), an American botanist, horticulturist and a pioneer in agricultural science. 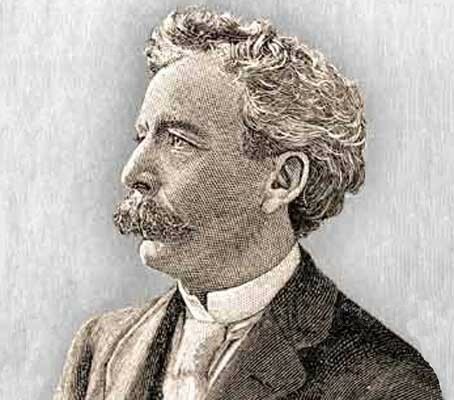 Luther Burbank had a great fondness for the wild ox-eye daisies that grew under the elm tree in front of his family home and in the fields of New England in his day. Many years later, the young plant-breeder was inspired to develop these wildflowers for use as garden flowers, and envisioned an ideal daisy: it would have very large pure white flowers, long blooming period, and be good both as a cut flower and garden plant. The development of this perennial began in 1884. In order to achieve his goals he used four different plants, creating a quadruple hybrid. He started with the ox-eye daisy (Leucanthemum vulgare) and cross-pollinated it with the English field daisy (Leucanthemum maximum) which had larger flowers than the ox-eye daisy. The best of these hybrids were then dusted with pollen from the Portuguese field daisy (Leucanthemum lacustre) and their seedlings were bred selectively for six years. These bloomed nicely, but Burbank wasn't satisfied yet. He wanted whiter, brighter flowers. He took the most promising of these triple hybrids and pollinated them with the Japanese field daisy (Nipponanthemum nipponicum), a species with small, pure white flowers. Finally, he got the beautiful large white daisy that he was hoping for. He named it for the lovely glistening Mount Shasta in Northern California. The Shasta daisy hybrids were introduced in 1901 after 17 years in development. 2001 marked the 100th anniversary of Luther Burbank's introduction of the Shasta daisy, one of the most beloved garden flowers. Don't be alarmed if you encounter a little confusion when looking for this useful plant by its botanical name: It has more than one. Nobody argues about the cultivar name 'Crazy Daisy', but you may find Shasta daisy listed as either C x superbum or C. x maximum. It can also be found as Leucanthemum x superbum and Leucanthemum x maximum. We have also seen it listed as Chrysanthemum leucanthemum x superbum maximum - a bit or a long name for a plant label! To clarify - These daisies were formerly classified in the genus Chrysanthemum. They were first classified as Chrysanthemum maximum, and more recently as Chrysanthemum x superbum. They were then transferred to their own genus of Leucanthemum because they lack some traits of true Chrysanthemums. As long-time gardeners, we've become used to having plant names change, however, this name is not yet in full use in the horticultural industry, so for the moment we will still refer to it as Chrysanthemum x superbum “Crazy Daisy”. The old genus name Chrysanthemum is taken from the Greek chrysos meaning 'gold' and anthos meaning "flower". The new name Leucanthemum means 'white flower'. Taken from the Greek leukos, meaning ‘white’ and anthos meaning ‘flower’. The old species name 'maximum' simply means 'the largest', while 'x superbum' translates as "superior" and denotes the hybrid vigor. Commonly called 'Shasta daisies', they were named for Mount Shasta. Mount Shasta is the cone of an extinct volcano rising to a height of over 14,162 feet above sea level, and is one of the largest volcanic peaks in the United States. It is a most majestic mountain, part of the Cascade Mountain Range, located in Siskiyou County in Northern California about 45 miles from the Oregon border.